Have you always wanted to drink your favourite brew Badger stylee? Well here’s your big chance! That’s right folks it’s prize giveaway time! 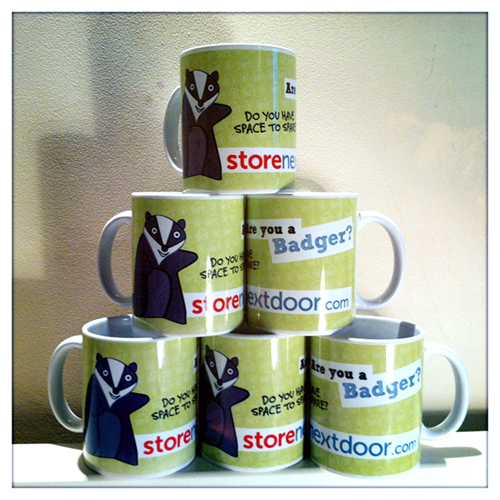 Here at Storenextdoor HQ in Bath we’ve got 10 of these very special mugs to award to the next 10 people to list their spaces at storenextdoor.com. You can list a space in your garage, basement, spare room or even an outbuilding – we probably have people who need self-storage (the Squirrels) searching in your neighbourhood at this very moment. Who wants to go down the Big Yellow when there’s a better value, fully insured, closer option (Yes! In YOUR house!)? It doesn’t matter where you live… Bristol, Bath, Bury, Bournemouth, Brighton or even somewhere that doesn’t begin with B, you can advertise your space in our listings for FREE and you will receive a lovely shiny present in the post as a thank you for being one of our new Badgers. If you need help to get started check out our earnings estimator to see how much your space could be earning for you every month (so – you really can make money from your home even when you’re asleep…) – and if you live within 20 miles of Bristol we’ll even help you come and get started. ← Newsflash: Storenextdoor featured in the Sunday Times!